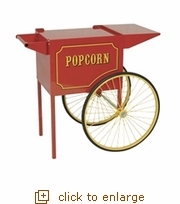 Popcorn Popper Cart - 6oz. or 8oz. Home · Bowls & Party Supplies · Commercial Popcorn Poppers · Popcorn Popper Cart - 6oz. or 8oz. Product Reviews for Popcorn Popper Cart - 6oz. or 8oz. An old fashioned street cart to be used with our 6oz. or 8oz. commercial poppers. Great attraction and conversation piece and provides easier access, better merchandising and great mobility. The sturdy all steel construction has a chip resistant coating. Also features convenient built-in storage space and breaks down easily for storage and transportation.